Blogging commentary for July & August. At one point, I was more willing to write about current events than to discuss them. This began to worry me. Was I more comfortably confessing my inner soul to strangers on the Internet than sharing with friends? That can’t be good. However, I think it had more to do with getting work done than with psychic turmoil. Lawrence Block (I believe) divided writers into those who like to hash out their projects beforehand and others who feel this dissipates the energy. A member of the latter camp, I didn’t want to talk about current events when I was still trying to get the phrasing right in my head. Afterwards, wanna know what’s going on in my life? Oh, just read the blog. This was more likely to be the case when I was posting monthly (Back To Eventing & Back To Riding). Then, I had weeks to prepare and ponder. These days, after 256 daily posts, I rarely have a idea what I am going to say today much less in the future. I still want to point people at the blog when there is a question to which I do not have a short answer, as in Why don’t you buy another horse? Having spent a week discussing it [Horse Shopping 1-4], I want to hand them the dates and say, Oh, just read the blog. Bloggers, would you rather blog or talk? An untenable surplus of blogging assistants. 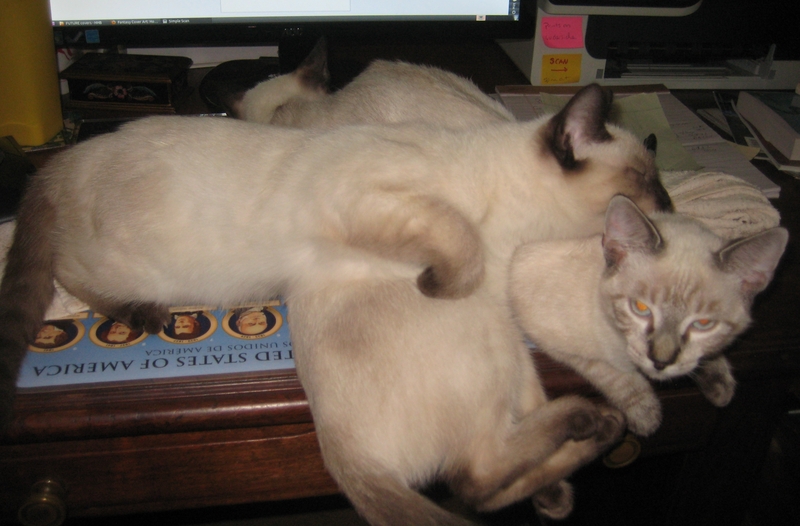 My desk is an enormous wooden law desk, yet all three kittens try to fit between me and the keyboard. This gets harder as they get bigger. I would always rather write than talk.